Correction: Whoa. Talk about a brain fart. Of course this is the Darksaber, a saber introduced in The Clone Wars. It’s not new like the article originally said. I mean, it’s new to Ezra, but not us. The original post has been edited below. Apologies for my idiocy. One of my favorite things about Star Wars Rebels is how it can oh-so-casually introduce a bombshell moment in the Star Wars canon into your life. The introduction of Thrawn was a big one. Ezra looking into the Holocron is another, and now Ezra is confronted with another one. It’s from this week’s new episode called “Visions and Voices.” Check it out. 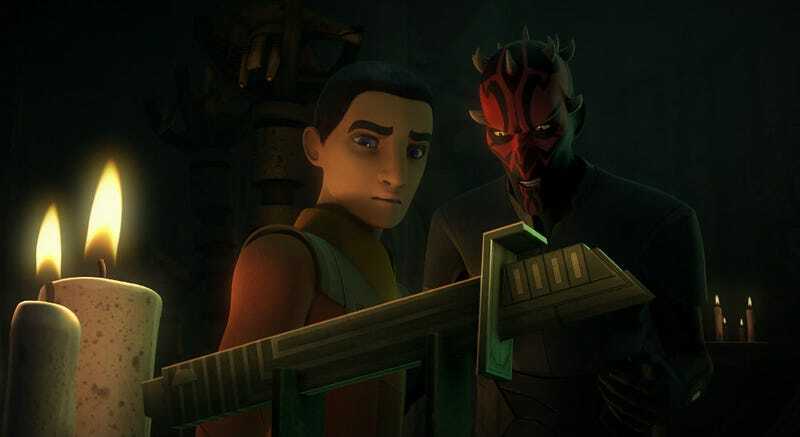 Ezra has now seen Darth Maul’s Darksaber, a saber he wielded during The Clone Wars that was stolen by the Mandalorians. Hence why Sabine would know something about it. It’s going to be interesting to see if we learn more about the saber’s history, and what that history might mean to Ezra, who himself has been known to modify a lightsaber or two. Also, what else does Maul have in that room? Any bigger secrets? I kind of hope this entire sequence is longer simply because it’s absolutely ripe with Easter Egg potential. Since it’s all artifacts from a time when Darth Maul was at the height of his powers, I hope Dave Filoni and his crew put in some Ric Olie action figures in the background, or maybe some Jar Jar Binks soap. “Visions and Voices” airs December 10 at 8:30pm on Disney XD.